No Cornucopia of Gas | Watts Up With That? The natural gas price bottomed in April this year at just under $2.00/MMBtu and is now $3.40/MMBtu. That is an increase of 70% from the low. More is needed because the average price to give a 10% rate of return in $4.50/MCF (1 MMBtu is very close to 1 MCF) as shown in Figure 2. Most of potential US shale gas production is uneconomic at the current price. So why are shale gas wells still being drilled? A lot of acreage is “held by production” in which a well on the lease has to be brought into production in a certain period or otherwise it goes back to the mineral lease owner. The number of rigs drilling for gas is now down to one third of what it was at the peak four years ago. There were about 700 drilling rigs operating in the US a decade ago. That has almost tripled with most of the rigs looking for oil. So with the number of rigs drilling for gas continuing to drop, that will eventually be reflected in natural gas production. How that works is illustrated by Figure 4. Back in 2000, the wells in production had a 23% decline over the following year. Now the decline rate is 32%. The treadmill has speeded up. To get a longer term perspective, let’s go back to the gas price. Traditionally, the US natural gas price traded in line with the No 2 Fuel Oil price in energy equivalent terms, so the gas price tracked along with the oil price. If that still held true and with a barrel of oil being equivalent to 6,000 cubic feet of gas, the current oil price of $89.92/bbl would equate to $15/MCF. 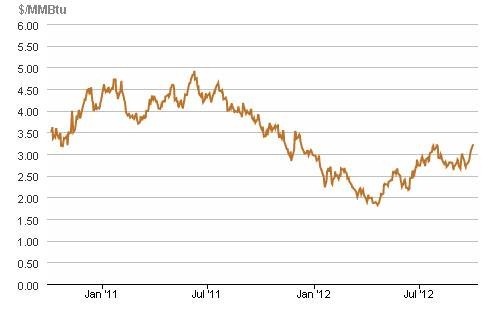 As shown in Figure 5, as the oil price started rising last decade, the gas price rose along with it until the “Shale Gale” hit. The relationship between gas production, gas price and rig count is shown in the Figure 6. Rig count and gas price are closely coupled. There is a considerable lag from drilling to production. Drilling activity started rising in 2000 but production declined to 2005. Conventional gas production has continued to decline and the rise in production over the last six years has been due to shale gas. If we plot gas price relative to rig count, there is a strong correlation. All this is telling us is that higher gas prices draw in more rigs. It is a lagging indicator, like carbon dioxide in climate. High gas prices are the seed of their own destruction. Figure 8 has some predictive ability. For gas prices to rise to the price at which US shale gas on average is economic, production has to fall to about 1,700 billion cubic feet per month from the current level of about 2,000 billion cubic feet per month. I expect prices and production to seesaw until an equilibrium is reached. Excluding the effect of liquids content, the US shale gas industry will be characterised by profitless prosperity – the majority of players will eventually get a 10%-odd rate of return on being in the business. Not sure if the point you are making is that prices will be rising or that supplies of gas are limited. The headline doesn’t seem to match the concision. They probably can’t stop drilling. Investors put a lot of money into them on the basis of fracking enhanced production which dropping off and while production is a bit high, they need more activity to keep the money invested in. I don’t see either a point or a conclusion. There is nothing in this post that shows that existing shale gas wells are un-profitable. As long as they are bringing in more than their operating costs in revenue they will be profitable and have a positive ROI. One thing to keep in mind is that oil wells often produce a lot of natural gas. I suspect that’s especially true with oil shales, but that’s getting well beyond my expertise. US oil production has started increasing and will continue, so estimates of the collateral natural gas should be added to any oil discussion. Yes, by all means. There is hope for the fossilf fuel is evil crowd and they will use it. Just add to the costs of production. While there is indeed a lot of commitment drilling and trickle production going on, there is also the volume of associated gas that comes with the new Tight Liquids plays (Eagle Ford and Bakken). The liquids production will also continue to affect gas supply. What nonesense. Oil and gas are eventually interchangeable. You cant have $85 oil and $3 gas.So production doesnt have to fall for gas to rise. Gas will rise because its much cheaper on an energy equivalent basis. Typo in the title; it should read “Cornucopia of Gas”. Matt says: “A positive ROI < 10% does not make something uneconomical. To be uneconomical ROI must be less than or equal to 0"
Just to be pedantic: it's uneconomical if the ROI is less than the risk-free rate of return in the economy (which is near 0% right now because of federal reserve actions). I think you need to be more specific about ‘Rig Count’. In Fig 3, you make clear that you can separate out Gas Rigs and Oil Rigs in the count. Figure 7 only makes sense if your Rig Count is Gas Rigs. looking at the data, it probably is, but it should say so. I would also color or shape the points based before or after 1/1/2008. Figure 7 and 8 work better if Gas Price is on the same axis. It might be interesting to plot Gas Rig Count against the 1 year Gas Futures price. On Fig 5, plot 1 year Gas Future price as a separate series on the Gas Price (Henry Hub Spot). This is called ‘Market Forces 101’. The gas became more plentiful so the price dropped as did the huge profits. Eventually, the price drops far enough and supplies seem secure enough more people purchase the gas or build gas fired generating facilities. This takes time. Therefore, initially there is a slight glut and prices fall, then the elastic demand bounces back and prices rise. Then eventually the base load power generation starts using the gas and the price starts to stabilize. This is nothing to do with the quantity of gas still in the ‘shale’ waiting to be frac’ed. There is also an international aspect which is larger in other continents where ‘conventional’ natural gas suppliers have been trying to force the price up, and now have the ground fracked away from under them. Their response to more supply will be to try to keep in the market and drop their prices making fracking less attractive – although not unprofitable. Again this will reach a balance point and has nothing to do with the amount of gas available. David is correct, but then starts excluding the liquids from the equation. That/s precisely what’s got people so excited about Eagle-Ford and several other plays, there’s a lot of paraffin holding liquids along with the gas. There is so much, that the gas is almost free. We need to be careful when talking about energy production. The qualities of the well contents are critical – there’s a reason why Brent crude has a premium over Saudi, or West Texas Intermediate, and that’s the content. With gas it’s the same thing. All gas wells are not the same, thus the cost of production versus sale price varies a lot. Gas only plays are uninteresting, gas and liquids, much more interesting. The Bakken Shale and others are oil plays, not gas. Since we import oil, this will have a much larger impact on our energy consumption than the gas has. We all can see what cheap gas has done, imagine the impact of much cheaper oil due to vast supplies. We’ll go through the shale oil, then take that technology and work through the tar sands. Baring political interference, there will be reasonably priced oil for hundreds of years. That having been said, I’d prefer to use oil in recyclable products and get my power from electricity via low residue fission reactions. Directly generated inexpensive electricity is way more helpful than other types. I don’t see solar, geothermal, tidal, hydroelectric, wind, or any other currently existing technology delivering anywhere near the clean, safe, energy as LRFR for anywhere near the price. Figure 4 is the key. The US is gambling very heavily on natural gas. I see a very dangerous cost increase in the near future and with the shackles we’ve put on the coal industry, expect to see significant, economy crippling increases in the price of electricity. Solar and wind will not save us. Hug a coal or uranium miner. Thanks to blaring media and Wall Street, it has become a universally accepted “truth” that natural gas supply in the U.S. is now infinite, inexpensive and unlimited. The liquid rich plays such as Eagle Ford and Utica produce at very high gas to liquid ratios. There will be pressure on the gas market with associated gas sold as a virtual by-product. But wait-there’s more. Staggering quantities of gas are being found all over the world–the NW shelf of Australia, Mozambique, Turkmenistan. These are huge finds which can and will support huge LNG facilities. Then there is the fact that while organic rich shales are all over the world, there has been very limited production from them outside of the US. That will be changing soon. The world wide gas market will be well supplied, and the threat of our domestic gas price being driven up due to exports is over blown. If only the the CAGW people could be proven wrong so quickly and thoroughly. Can someone explain the intense feeling of schadenfreude. I feel, when I begin to hear of shortages and price increases due to self inflicted scarcity. Have the price graphs been adjusted for inflation? Especially important in the age of currency debasement via ‘quantitative easing’ ( aka money printing ). The graphs suggest the dollar cost of natural gas today is the same as it was in 1987. But today’s dollar would only be worth 50cents in 1987. This is why the Saudis know very well that the real price of oil is just about $35 boe. With a thousand years of gas reserves in place guess what? You do the math. producing easily handled wastes, are a barrier against proliferation,and have proven more reliable and cost effective than conventional reactors, utilities would find these very attractive alternatives to either coal or gas for their base load power. I predict that they will have the option of buying these BREST reactors within 5 to 7 years. It would be helpful to have an administration intelligent enough to get behind this technology in a PR, educational fashion, to convince the public of its many advantages. It would be churlish to not share Ric Werne’s [sic] joy over a lower gas bill. That said, I believe his post “Cheap Natural Gas, but wait – there’s more” is misleading. Misleading? I certain never intend to mislead except maybe an occasional troll. Misinformed, might be a better word, after all I’m a bit pusher, not a BTU pusher. 2012 FPO price $0.6919/therm. Fact, though I think I recycled the letter. BTW, that’s $6.92 per MMBtu, so the local utility sure isn’t getting any of that current $3.40/MMBtu. At some point another 50% drop just isn’t like that first 50% drop from 2009’s $1.2835/therm. New businesses and jobs in the US? Well, if “500,000 New US Jobs By 2025” doesn’t happen, I’ll go visit Pierre. It’s only a few months’ job creation, but those jobs should spawn more jobs too. Exporting LNG? danj said we’re exporting LNG now. Domestic trucks running on LNG? I confess I haven’t seen either truck nor filling station, but New Hampshire is not on the major trucking routes. It doesn’t even get cold enough here to not need refrigeration to make LNG. But you knew that. That leaves that Harvard discussion paper. While it’s focus is on oil (the title is Oil: The Next Revolution, it does make a number of references to the gas industry. In fact, given all the different plays it mentions, that’s likely the best example of a cornucopia of oil and gas fields in North America. Thanks for hunting down better graphs of things like the US Natural Gas price. I would have but kept finding more topics to mention. Thanks for the stats and facts David. I have been following the latest energy boom and another thing to keep in mind is economic contribution to individuals – increased employment for workers, engineers, geologists, et al, as well as increased personal wealth generation for investors, land owners, municipalities et al. It is all good. Compare to the pathetic contribution to our economy and energy generation as promoted by our current federal administration under Chu and Obama – investing public monies in nonsense like Solyndra while preventing energy extraction and slowing and stopping pipeline and infrastructure development (Keystone). … can’t wait for the methane hydrate wells to come in. The world is afloat on a sea of methane. The data presented here strongly supports is that there are strong & visible market forces between supply & demand at play in the natural gas market. The market was initially (in the mid 2000s) under supplied, prices were high so drilling increased to match that demand. Then, the market became over-supplied (late 2000s , partially due to the overall recession, partially due improved technology chasing shale gas plays) & prices fell in reaction to over supply. So, the drilling slowed down to reduce supply & get supply back in line with demand & now prices are responding to that by coming back up again. This is a beautiful & classic case of economics 101. As such, the data argues there is no real constraint on the supply side of the equation at this point in time – the industry can supply what ever the economy demands. It is really the demand side of the equation driving the boat & the supply side simply reacts to that. Thus, the title of the article should drop the “No” & simply be “cornucopia of gas” because the data present suggests we currently can supply any amount of gas the demand the economy currently has. If the ITER folks can meet their goal, (500 MW ouput for 50 MW input) the long-term future becomes a little less certain. Bronze (my favorite, see below), we learn to work iron. Greeks changed ship construction because of a shortage of wood. We were running out of trees for heating. Enter coal. We were running out of trees for railroads. Enter better engineering and creosote. We were running out of oil (from whales). Come Pennsylvania. Running out of food. Green revolution. 1970’s oil crisis. Let price rise. Drill in deeper waters, far away places, build tankers. The Bronze story, as I said was my favorite. At the end of the Bronze Age, iron was a known metal, but it was quite expensive. Archeologist have found silver rings with iron wire as orimentation, like we use diamonds. Bronze is a mix of copper and tin. Copper was local to Greece, but tin needed to be imported. The Phonecian pirates put a crimp in tin shipments for about 80 years. In that time the price of Bronze went up, Bronze recycling became common place, and metal smiths looked for alternatives. They found ways to smelt and work iron. In those 80 years, the price of iron relative to bronze dropped by a factor of 10,000. Thus began the Iron Age. The book is a good read. Free Minds and Free Markets when combined give off great power. There are two possible issues with the blog. 1) Technological change is happening very fast in the oil industry. In the last 5 years, the length of “horizontal” productive “leg” of wells has gone up by at least 50% (longer horizontals mean more gas produced per well and lower cost). The completion technology is improving tremendously (lowers the cost of producing a unit of hydrocarbons a barrel of oil or mcf of natural gas). Frac companies continue to compete by developing the best method of fracing a well for the least cost. I believe that frac effectiveness as measured by the resultant gas production has improved 10 to 50 percent over the last 5 years depending on the basin. There are a few other technologies that have been developed. Some of them have increased the speed that a drilling rig can drill such that the average rig in the United States now drills quite a bit faster than it did even 5 years ago. Other technologies have improved the ability to log the well while drilling. In other words, a drilling rig can determine much information about the composition of the rock while they are drilling. Other technologies have been developed to determine how effective a well frac is working while the well is being frac’d from the surface. This helps them determine if any changes need to be made almost real time. I’ve only mentioned the highlights of the changes in technology. 2) Initially, after fracking a well, the well produces back the frac fluid (cleaning up) then begins producing. After a couple weeks to a month after a well is fracked, the well will probably be able to produce at it’s maximum rate. If the well is produced at the maximum rate, the amount of hydrocarbons will decline fairly rapidly initially with a hyperbolic decline curve which will likely transition over time to an exponential decline. After about 2 or 3 years, the well will be producing at a low rate. After which time, the well will decline much more slowly until eventually, after 10 to 30 years, the well will not be producing sufficient hydrocarbons to pay the cost of operating the well. It will have reached it’s economic limit and will be plugged and abandoned. But some wells are not produced at the maximum rate. There is a lot of evidence that ultimately wells in some basins will produce more hydrocarbons if they are produced initially at a much lower rate than they are capable of. The slower production prevents both natural fractures and induced fractures from the frac treatment within the rock from closing as the gas pressure in the reserve declines. This allows hydrocarbons from farther away to move towards the well bore. But once the fractures close, hydrocarbons from farther away have difficulty moving towards the well. Another reason to produce at a much slower rate is because natural gas prices are low and many operators think the prices will increase in the future. Changing the production regime in order to increase ultimate production or to produce slower due to low current gas prices possibly have biased some of the gas production curves above. Finally, due to how new drilling large numbers of wells in shale really is, and due to initial hyperbolic decline rates of new wells, companies have to continue to drill many wells to keep up with the declines of older wells and increase production. However, if they maintain drilling long enough, many of the older wells are in a slower exponential decline and the overall decline rate of the wells a company has will be less. There is no such thing as risk free ROI. Even government bonds cary risk. The risk may be very small, but it is non-zero. It is disturbing that the US Patent Office rejected this patent application, giving some lame excuses why it couldn’t be accepted. However, their opposition won’t stop world-wide acceptance and utilization of this paradigm-shifting energy technology, which has the promise to exceed all others. Ever since construction crashed here in California I’ve been trading for a living and the first thing I learned (and the tuition was expensive) was that price generally has very little to do with fundamentals when talking about periods less than a year or so. The saying “The market can remain irrational longer than you can stay solvent” exists simply because fundamentals matter so little when trading the market. The natural gas market isn’t something I trade but a quick look at the futures chart suggests to me that while we’ve been in an uptrend since April the longer term trend is actually down. In fact, just earlier this week on Tuesday that the market hit a price target for the uptrend and also hit a price where I would expect prices to turn back down. 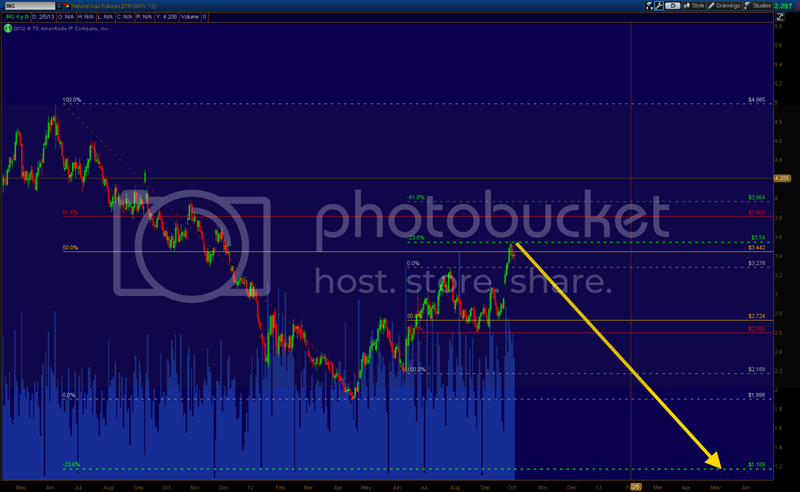 The price target for the next move down is $1.169/MMBtu. Will this happen? I don’t know. A break above $3.8/MMBtu and all bets are off but it will be interesting to see how it plays out. Regardless, my point is that looking at price trends over shorter periods and attributing them to fundamentals isn’t the correct way of projecting future prices. NG prices are going up, no two ways about it. The euphoria has ended. The EPA is going to crack down on fracking which will cause NG prices to skyrocket, and since ObaMao has effectively killed the coal industry, consumers will pay this COLD winter. Figure 4, Steepening Decline Curves in Natural Gas Production is a compilation of only shale gas reservoirs, conventional gas reservoirs, or all gas reservoirs? Does it imply that gas wells completed in 2000 had initial annual declines of only 23% compared to 32% presently, due to variance between conventional and shale reservoir plays, or fracking technology? What are units of the left hand scale? We need more research on the compulsive need for academics to worry about everyone else’s problems. Real or imagined. Fed Reserve actions in printing money have driven the risk-free return on investment negative due to the inevitable inflation. 500 MW thermal; figures to be what – somewhere around 200 MWe (electrical) then? The size of a good-sized ‘peaker’ electrical plant. 1 MW (thermal) ECAT COP minimum of 6 (for safety reasons; assures positive control) and these devices are in production stage and can be installed at or on any given industrial site (property) … should be a boon to those users who need to bulk-heat water for industrial purposes until the hot ECAT allows direct generation of electricity with 600C steam generation in the future, and again in any local industrial location without special imposing ‘nuclear’ regulations. 1. Mineral Leases generally are for a specific period of time. If the company that leased the rights does not drill, the lease expires and the mineral rights holder is free to sign with someone else. But many of the leases made were relatively cheap, made at time when no one had a clue how much gas was there. If they are not drilled now, the leases will be expensive to re-aquire. Bottom line-it favors drilling even though prices are low. 2. Natural gas is not convenient to store much less so than oil anyway. It needs to move to market quickly for it to be profitable. Same could be said of oil, but much less so. Bottom line-spot gas prices can fluctuate wildly. 3. At present, nat gas operators are drowning in their own success. Rig counts are falling, finally, which is good for prices, and eventually demand will pick up as new and clever uses of the resource are developed. 4. Contrary to the headline title, there really is a cornucopia of gas. If a clever way can be developed to utilize it as a transportation fuel we will be looking at a HUGE improvement to our nations balance sheet. But we need something more clever than compressed or liquified gas tanks for our vehicles. Maybe a smart chemical engineer can figure a way to combine coal + methane to make a high quality refinery feedstock about the weight of iso-octane? It is disturbing that the US Patent Office rejected this patent application, giving some lame excuses why it couldn’t be accepted. I don’t want to hijack this post, and I’m sure Anthony would wish we’d not talk about LENR, but the impression I got was that the patent didn’t disclose the invention in adequate detail. At least, from the discussion I saw, I couldn’t figure out what it was disclosing. I’m not surprised Rossi has gotten distracted with the hot CAT, but he’s kept numbers close to his chest, so not yet time to mention it here except in passing. Interesting things in the works on many fronts. Oh. And regarding the eventual 10% return on investment…this is probably about right, once the risks involved in a particular play are ironed out, the E&P companies are free to spin off the reserves using a Master Limited Partnership structure or similar entity with a pass-thru taxable structure. These kind of investments are very tax efficient and can be a very lucrative means to develop low risk resources. I’m still in the wait-and-see stage with ECAT. Violates too many of my firmly held superstitions as re room temperature nuclear reactions. I put the putative energy gain to the device outputting low quality steam (steam with entrained water), which would inflate any energy measurement based on steam flow. With ECAT, calorimetry is unacceptably rudimentary. Winter Hawk: Leaving aside the question of units for Fig. 4, I believe that the increasing decline rates of existing wells reflects the increasing portion of gas production from shale reservoirs. They generally decline by 60-70% from their initial rates during their first year. A predictable result is that a cessation of drilling would be followed by a rapid decline. We saw this with the oil price collapse in 1986. Companies with production from tight, high initial decline rate wells could maintain stable production year after year as long as they could keep drilling new wells. That ended with the price collapse and many bankruptcies quickly followed. Oil production from the Bakken formation may be maintained at its present 600-700 thousand barrels per day as long as new drilling continues, but if oil prices drop below about $70 per barrel, there will be a rapid decline. Okay, this is a better energy post than most I’ve seen at this site. There is a problem though in the misrepresentation of the accelerated rate of decline in gas wells compared to 10 years ago in Figure 4. This and productivity improvements in the drilling process are ignored. These issues add up to a problem for the average reader but thankfully the summary of the post is basically correct in that the gas glut will be with us for some time in combination with volatility and less than stellar rates of return for investors. I suppose those lowered expectations for investor return now reflect the low risk of drilling in shale plays. On the issue of accelerated decline rate of wells, keep in mind that the production profile of the median shale gas well has shifted up at all points on the profile compared to the early stages of shale gas extraction plays. Longer laterals of wells and more frac stages in the average well and cost reductions for the average gas well including average days to complete a well suggest movement in the break even point and ROR for wells. The supply issue for shale gas wells is that there may be some large rates of decline in the first six months of production but the long-run production in the flatter part of the profile is still interesting and does not represent a crossing of the old and new profile curves. The conclusion for the non-expert is that the initial decline rates of enhanced shale gas wells does not mean they will go quickly into dormant, non-productive status. While the many uses of cheap gas will expand demand in areas including LNG exports, accelerated conversion from coal base load electricity to gas base load, and other consumption changes, we will be seeing generally low gas prices and abundant supply for some more years than producers would like. There are a lot of shut in wells and a lot of long-life wells that only the industry appears to understand at this point. Meanwhile the oil shale drilling is pushing more byproduct gas onto the market and this will get worse as pipelines are added to new oil shale-producing regions. These are complicated topics for web posts but I think David got to the same basic assessment of the commodity space. Not all natgas is found in the US. A lot of it is in various war zones, and influences strategic moves by countries around the world, including the US, China, Russia, etc. The TAPI natgas pipeline for example is a very big deal. This route is in direct competition with one proposed from Iran to supply the same market (India, Pakistan). Let’s not be too provincial, hey? Turkmenistan’s natural gas reserves are the fourth largest in the world according to energy giant BP, behind Russia, Iran and Qatar. The reclusive Central Asian nation is far from alone, however, in hoping to capitalize on this fact. Numerous outsiders including, but not limited to Russia, India, Pakistan, Turkey, China, the US all hold interests in the nation’s vast hydrocarbon stores. Some seek direct access to the reserves for energy purposes, while others’ interests are more subtle and strategic. We’re going to try to break down these competing interests into country-specific narratives to flesh out the importance and complexity of the game developing in and around Turkmenistan. Also, I have seen multiple comments on several blogs about LENR. So far as I can tell, it’s a scam, not science. It’s kind of like climate change rhetoric–just hang in there another year and this thing will REALLY work out, we know it will. Please do not write such things, as the cat perched on my shoulder gets frightened by the resulting laughter and will dig her claws in for support, even through my jacket. Ouch. Por favor, mods and Anthony; a little leeway for a mild divergence from the present topic? Someone needs to ‘man up’ and write a review here on this subject; a LOT has happened the lasts couple of years on this subject including several formidable demonstrations (with actual ‘production’ grade/deliverable hardware) and a couple of actual USPTO patent grants. I haven’t heard any mention that — this according to what I have read and a few well hands I’ve personally spent some lengthy discussions with — drilling one well today is equivalent to drilling three or even more wells a few years ago with the new technology. Where is that multiplicity played into this articles assumptions and graphs? Completely disagree. There is a cornucopia of gas at $6 per MCF in the US. We probably have at least 600 years of coal and as much as 1,000 years of natural gas. There is also absolutely no shortage of Oil at current prices – supply is practically unlimited and mainly constrained by various governments (rentier states) & heavy taxes & higher extraction costs. This is merely what we know to be accessible. There is no more really cheap oil or gas because these fuels are essential for modern economies and demand is increasing globally even if it has stabilized in stagnant Western economies. The peak oil doomsayers are no better than the CAGW crowd – it is total BS. The natural gas industry is a classic Austrian boom-bust. Until you understand that, drawing any conclusions is dangerous. The natural gas boom was caused by 2 things. First, the technological breakthrough of combining horizontal drilling with the ancient technology of fracking was a very real, massive break through. The second cause was the Federal reserve lowering interest rates to 0.25%. This kicked off the boom, whereby companies borrowed heavily and caused the massive increase in production. Prices dropped to the point that we reached a SOLVENCY problem where the well could not pay back the PRINCIPLE. This is how the market corrected the over supply. Once this price was reached, we have the classic Austrian Bust. That is where we are today. As far as decline rates, I would not draw conclusions there. When you are bankrupt, you don’t have the money to perform work overs or enhanced recovery projects. You just milk the cash instead. Surely all this tells us is that Shale Gas is not the final answer. When gas prices soared to painful levels, innovation brought us Shale Gas, and pulled gas prices back down. So it would be fascinating to see if it is possible to predict how much price pain is required to trigger new innovation. That way, when the pain point is reached, and if the new innovation is not forthcoming, then we might have a problem. There is a planned $12 Billion LNG plant on the coast of British Columbia, for export of natural gas to Asian markets. How will that affect prices? This is why it is essential to regulate coal out of the market. Otherwise it would set a hard limit to natural gas prices. Which is rather inconvenient, as it increases the pressure to decrease cost of drilling through innovation. It is way simpler to limit production and push prices up, is not it? Applying the principle of cui prodest it becomes crystal clear that the Great Carbon Dioxide Scare is backed by Big Oil (or rather, Big Hydrocarbon), contrary to murky allegations coming from the cAGW camp. – Royal Dutch Shell: A carbon price for Australia – finally! I’m a little confused about the point of this post. It’s not profitable to drill a gas well when the price is under about $4. The ability to make a profit seems to be a better predicter of drilling activity. All right… Let’s correct a misconceptions here. By definition, an “economic return” is one that exceeds it’s cost of capital. This cost of capital is always at some risk adjusted premium to the proxy for the risk free rate of return. The financing structure of the investment along with credit worthiness of the individual/company will essentially determine what that rate is. For a new NG venture, you are likely looking at close to 100% equity financing. Taking a quick survey, based on delevered betas of pure play natural gas companies, i would say the expectation is in the 1.2 * market risk premium area. Current thinking on what the standard market risk premium should be (what premium over the risk free rate should be expected for an asset that moves in lock step with the aggregate market) is somewhere around 6% (some do argue for 5%.) This means that, in general, new NG companies are expected to produce a 7.2% premium above the risk free rate of 2.5%, so 9.7%, which is basically spot on with what David used for his ROI assumption. Anything returning below this rate would technically be considered generating an “economic loss”. If for whatever reason, a mature, stable company that issues investment grade bonds were to be highly levered, let’s say 70% debt financed, it is likely the required rate of return on new investments would be in the 6% range on a weighted average cost of capital basis. The absolute lowest you would go, for a 100% debt financed company, would be in the 4% range. That, of course, is provided you could find underwriters willing to issue bonds at investment grade rates for a 100% debt financed company that sells a commodity with high price volatility, which is unlikely. In that case, you are probably borrowing at high-yield rates, which probably puts you back in the 6-8% range on your 20 year debt. Overall, investors in this sector are likely to be seeking a 6-10% ROI, and depends primarily on debt to equity ratio. The thing about wells, in general, is the majority of their costs are fixed. Once they are in the ground, you will continue to produce at market price so long as it exceeds the variable cost of production. As such, the price of NG moves towards the marginal cost of the last MSCF needed to meet demand. As the world moves out of the recession, and demand for various consumer goods rises, we will see a corresponding rise in NG costs due primarily to increased consumption for petrochem processes. From there, we will probably see a much more careful matching of production to demand, than what we saw when gas spiked in a relatively short time to $12/MSCF, such that new wells going into the ground will fetch a market price that earns a 10% ROI. I believe that number is currently somewhere around $5.00-$6.00/MSCF, and if you look at most long term industry outlooks for US NG prices, that is where they expect the price to head over the next 3 years and out into the foreseeable future. Any thoughts on conversion (cracking) of Gas to Gasoline/Diesel? Wouldn’t that broaden the market and help support the natural gas price? There are a couple posts, the most recent is about a year old, see http://wattsupwiththat.com/2011/10/28/test-of-rossis-1-mw-e-cat-fusion-system-apparently-successful/ . That raised enough controversy from young physicists that Anthony banned more posts on the topic until there is a good third party review. That hasn’t happened. Also, things are a bit confused – I’m not sure what’s happened to the Ecats that were supposed to be selling now, Rossi’s interest in something that runs much hotter would be a much bigger story. Pretty much everything involving a Swedish organization’s tests that concluded the hot cat doesn’t work is unbelievable to bizarre. I couldn’t figure out exactly what’s going on with that nonsense. All in all, it’s not time for an update other than a few drive-by notes. Besides, there are pleny of blogs and whatnot that do try to make some sense of the nonsense. Bottom line – not disproven, not available at Home Depot. Methane can easily be converted to Methanol, and I would think EPA could be persuaded to allow it as a substitute for their ethanol mandate. The law would need to be changed to allow this though. Plus it might be worse for the engine than ethanol. I.e. using methane plus coal to make a hydrocarbon with the approximate mol wt of gasoline. We have abundant coal AND now methane, so how about it all you chemE’s? If they don’t drill the lease before it expires they lose it, an exploration company with no leases to drill is a pathetic thing. Sometimes they just have to roll the dice and hope for better prices. Probably already done. Fiddling with the hydrocarbon distribution is a regular trick at refineries. But it’s probably unnecessary. In this part of the world gas is cheaper than petrol and so a lot of people run dual fuel systems, albeit with reduced trunk space. “Most importantly though is Westport’s ability to keep promises related to earnings. Its light duty division achieved a positive EBITDA one quarter earlier than promised. Its partnership with Ford (F) to produce popular Ford F-250 trucks with bi-fuel natural gas and gasoline engines is proving profitable, and it is planning a similar partnership with Volvo cars in the near future. Unfortunately, there are CAGW believers in the Oil industry just as there are everywhere else. There is really nothing wrong with using coal as long as it is scrubbed clean and especially if it is cheaper as it makes more sense to use it first instead of more expensive fuels. The CO2 Monster is just like Big Bird – it relies on government funding to sustain it. Looking at Figure 6 confirms a long held opinion – That rig count drops faster and deeper when the price declines than the count rebuilds when the price increases. That should create an additional bias toward higher gas prices, and reduce the chances for reaching any kind of equilibrium. Unnecessary, but perhaps more efficient. The point of the thread is that natural gas is currently marginally profitable, which may result in less production. A steady, storable supply of fuel is essential to avoid spikes and valleys we see today. Conversion to a more valuable, more storable, more portable liquid fuel would add value, increasing demand and price stability. Surely building or converting refineries is more efficient than converting the entire fleet of vehicles. The oil/ng industry lobbies for no coal, no nuclear, no anything esle to drive up the demand for petroleum based products so the price of their products increase to drive up their revenues to stock holders. It’s a no brainer. Forget about it. You are going to pay more for everything. Just because you can write an equation doesn’t mean it makes the slightest sense chemically. Not sure I understand what you are saying…do you mean they do not lobby? Or they lobby against coal? Man I know of dozens of industries that would KILL for a double digit rate of return! They’ll be producing gas at very affordable rate because of the uptake as more electricity suppliers switch to gas from coal and nuclear. We’re good for at least 50 years and if we don’t have our act together by then we’ll go through more price shocks. Mainly, fusion is more of an insurmountable engineering problem than physics problem and has been since the Princeton folks took apart their tokamak. The most important point I can make is that the notion that once it is worked out it will be CLEAN and INEXAUSTABLE is simply false. The equipment and buildings become radioactive waste, and lithium is already rare and highly useful in other applications. As someone who has working interests in several current gas wells, allow me to say that’s not necessarily true. It all depends on your liquids (condensate, etc) production. If your liquids production is high enough, your nat gas is essentially free, The liquids pay the bills, the nat gas sales are just the gravy. Now for pure dry gas wells, that $4 figure may well be true – but nobody’s drilling pure dry gas wells at these prices. To me this indicates that while nat gas is capable of short term spikes due to rising demand, any move towards $6 or above will bring on a flood of dry gas drilling and knock the price right back down again. I don’t think the articles use of the phrase “profitless prosperity” makes much sense – it’s just going to be a low but steady profit market for a long time to come. Wonder of wonders, nat gas may even stabilize at the $3 – $5 range and stay there for a couple of decades once this all shakes out. (constant dollar figures, of course) Having a stable price would be just as good for consumers as it would be for producers – everyone would finally know what to count on and what to plan for. Well it’s something to hope for, at least. ain’t that the truth…oh, the irony. I think it’s safe to say that You aren’t the smart chemE the world is looking for. Gas at 3 or 4 dollars per thousand cu ft may not be profitable in the US, but liquefying it and selling it overseas at 15 to 18 would be. It would also tend to keep the price of gas low in the US. Gas that could not be exported would be sold locally. It appears that there is building interest in Canada to develop a high-efficiency, fluid fueled nuclear reactor technology that might initially be used to help recover oil from their tar-sands. The proposed design is a simplified version of the thorium breeder reactor, which is primarily fueled by uranium. The hot liquid salt operates at ambient pressure. And thus is thought to be much safer than current high-pressure, solid fueled reactors. These reactors continue to cycle the fuel through the reaction chamber, only removing the fission fragments, which decay to a stable state in a few hundred years by electron emission. This is an example of a technology that might replace combustible carbon as a primary energy source after that becomes too expensive to use as a fuel. This may not happen tomorrow, but we all know that it will, eventually. “Candian David LeBlanc describes the benefits of liquid fuel Molten Salt Reactors over solid fuel reactors, emphasizing reactor design over any relative advantages of thorium or uranium. A very informed and informative article. Thanks. A couple of points on fitting linear trends. As is the habit in climate science this is as easy to do as it is misleading unless there is a good reason to suppose there actually is a linear relationship. I would suggest your figure 7 shows two very distinct ‘trends’: a rising trend below 6.5 MCF (units??) considerably steeper than the one you fitted; and more or less flat above that. ie there is a saturation point above which rig count is no longer linked to gas price. That is probably very significant. Similarly, your figure 8 supports a linear trend above 1850 but around 1800 it seems to be donimated by other factors. There are huge variations in price around that production level. Second point, in doing scatter plots, don’t forget these are not isolated data, they are time series. Don’t throw this information away by plotting isolated dots. Joint the dots to get the big picture. If you do this you will almost certainly see the outlier are not oddities but form loops. These loops represent oscillations in the time series. You say you expect that kind of behaviour, linking the dots may show it. There is a cluster around (1750 , $6 ) that seems to be the hay day max rig count. Figure 4 also invites further analysis. It’s not entirely clear what you are plotting here but there seems a clear exponential decay in each shaded area. Fit a decaying exponential to each shaded area, or plot that on a log scale for y and fit linear, I think you will find they all converge towards 10 (whatever y is ?? ) around 2020. Finally , if you use colour in the scatter plot to show progression in time you will see whether the oscillations are increasing or settling down. Time is a crucial factor in any such analysis. The scatter plots would be much more informative if you retained this information rather than removing it. It would be an interesting update if you could post such a modified version of figure 8. Thanks again for an interesting article, it certainly puts a bit of perspective on how shade is affecting gas production in general. David Archibald is always the prophet. But his “peak oil” dreams and visions are too rooted in the “known” – a better extrapolation would figure in the unknown innovative future techniques that will enhance both extraction and exploration. We do know there is a virtually unlimited amount of methane (methane hydrates) in the crust of the earth. If we somehow depleted the hydrocarbons available in shale formations – we would have barely dented the total methane. The future is unknown and unknowable; but David will keep trying to predict it. There is no Prophets Anonymous. 70.71/23=3.1 years form 2000 on. after five half-lives production is down to about 3%, not much. On that basis US gas is no longer going to be a significant energy source by 2020. Before that the price will rise. Buy your cheap gas now, it ain’t going to last. ‘Eventually’ is a long time. In the shorter term, where oil is used for transport and where gas is used for electricity generation, there’s little scope for interchange. 1. This article is about gas. 2. Peak Oil is not Peak Energy. I happen to think that we are at or near peak oil, and it doesn’t feel all that bad. The oil world should be able to pump out similar amounts of oil for many years, while the user world slowly moves as necessary into other energy sources. These are still plentiful, eg. coal, gas, nuclear, geothermal and eventually solar. This is where we need to be careful about the definition of Peak Oil. Since political factors will always prevent us reaching geological peak oil, it is reasonable to use actual peak oil as the definition for Peak Oil. ie, the point at which for whatever reasons global production no longer increases. There are some fairly hefty signs that we are just about there right now, but the nature of the beast is such that (a) we won’t know when it occurred until some time later, and (b) it isn’t necessarily painful. Now that is spot on. And again note the importance of a definition – in this context, ‘clean’ has zip all to do with CO2. 1a) Oil and gas are inextricably linked. 1b) This article starts out saying my article was misleading, and my article included references to oil. Until David shows up to explain himself, let’s go ahead and talk about oil wells that also produce natural gas, that’s where all the action is in the US anyway. 2) Are you saying all energy sources are inextricably linked? I happen to think that we are at or near peak oil, and it doesn’t feel all that bad. As long as you commute by bicycle, I guess. I suspect cheap natural gas is about the only thing keeping the USA from falling back into a recession. Don’t bike too much – food prices are linked to transportation costs too. Reliable energy from all forms in a free market….While parts of the energy business will be boom-bust (as for more than a century) if we also maintain free financial markets, businesses will be able to lock in energy supplies at known prices for reasonable periods. Plentiful supplies will keep prices as low as costs allow. Farmers will do well. Manufacturing is likely to start returning. Transportation will reflect real costs. We will prosper. But some speculators will go broke. In America, however, they will be given a second chance. If one of the new energy production modes is actually cost effective- it will gain appropriate market share. The government will screw up all of the above, with an “energy policy” that trumps good business and common sense. Anyone who has bothered to listen to the conference calls or read the 10-Ks has learned that shale gas operations are not self financing at less than $7.50 per Mcf. Yes, some wells in the core areas of the best formations can make money at very low prices but those are quite rare; the average well is a capital-destroying loser. The thing to remember is that the accountants have a huge amount of leeway when reporting profitability. If they estimate an ultimate recovery rate (EUR) that is several times the ultimate recovery indicated by the production data they do not have to fully depreciate the costs of drilling the wells and can reduce losses (or report profits) by as much as they wish. This trick is familiar to people who bought shares in Lucent and Nortel during the tech bubble. The massaging of their depreciation costs allowed the companies to give speculators the type of earnings gains that they wanted for quite some time. On occasion the companies would produce ‘one time’ write-downs where all kinds of assets would be revalued and the game would continue. But when the sector took a hit as a whole once the Fed’s money creation slowed the companies saw their stocks go from near $100 per share to less than a dollar per share. The shale gas companies is using the same accounting strategy to fool speculators into investing in their operations. The problem is that the energy invested in producing shale gas is very high relative to the energy contained in that shale gas and no matter what happens to prices long term profitability will be out of reach for the average shale well during all but a few periods of turmoil. Lest the sensitive among us be shocked by the discovery, realize that in an environment where government controls what gets to happen in critical areas for exploration, not supporting Climate Change research is suicide for the company. They are sensitive to pressures just like the scientists who are, perforce, required to put the idiocy in their otherwise excellent research papers. The argument that we don’t have or can’t imagine alternatives to hydrocarbon fuels today means nothing. The majority of people couldn’t imagine steamboats, steam locomotives, hot air balloons, gliders, self propelled aircraft, autonomous drones, space flight, geostationary satellites, or any one of a plethora of other inventions. The native curiosity of man, coupled with a market which could freely accept or reject an invention is what made all of it possible. Don’t kid yourselves, DARPA, as inventive as they are, pale in comparison to what the millions of curious brains have created. I just see a perfect head and [shoulders] bottom on figure 1. From an European perspective I can not understand the pricing of gas in the US-without thinking of how perfect it suited with the economic crisis. If it will last why are not cars converted to natural gas? Russia is trying to sell gas in offers You cant refuse, will that change with cheep LNG gas? Will Putin has to leave because of low naturalgasprices? Reagan together with Saudies sunk the Sovjet system with prices of oil at 10 USD/bl. Shale gas, and shale oil, suffer from the Red Queen Principle. (see http://www.theoildrum.com/node/9506 and http://www.theoildrum.com/story/2006/11/8/6636/36918) You have to drill more at an accelerated rate just to keep production flat. This is because, unlike a conventional gas field, shale gas fields drop precipitously in production, 80% drop in 6 to 8 years. This will mean that shale gas costs rise faster than the spot price, making them uneconomical. It also means that eventually there will be a limit reached when no more wells can be sunk, and output will drop. Actually the peak oil gurus used to claim peak gas would hit harder and faster than oil. You don’t hear that one much any more, but it is instructive and entertaining to go back a few years and revisit their predictions. There’s plenty of news coverage when someone starts converting waste fry oil into a diesel substitute or do a LPG conversion. I suspect it’s largely the size of the CNG tanks that’s the biggest block, but the news media’s lack of coverage about cheap natural gas may be a lot of it. Also, keep in mind we have relatively inexpensive gasoline at less than $1/liter. As much as we whine about that price, it’s low enough to discourage spending money on a CNG conversion or dealing with refueling. As for Russia, I’m not keeping up with them, but I suspect they won’t be as quick to threaten to cut off someone’s gas supply in the future. It’s in their interest to keep Europeans from joining the fracking revolution. This is one of the more idiotic things I have read on WUWT. Companies don’t make money on what accountants say. They make money on what they do and how well they do it. They won’t be drilling multi-million dollar wells if it isn’t profitable. What a bunch of garbage you spout. Firstly, Ric, thank you for giving me an opening to pen a bit more on this subject (I would not otherwise take the opportunity to distract our audience here with more on this subject). 5th point. Progress with the ECAT(s) is continuing, but since few ever go to ‘primary’ source on this (to the principles, the individuals involved) but would rather, it seems, depend on continued ‘rumor and innuendo’ it is no wonder persistent questions and doubts arise (the personal dealings between businesses bears no responsibility to make their moves or actions public!) Briefly stated, safety certification has been pursued (and achieved!) for the commercial ‘version’ of the ECAT and customer-involved testing has been performed on the 1-MW plant. As to how long cheap gas (or oil) can sutain us; we really only have to make it to the “Fusion” age. For decades they have been telling us that humans can get all the energy we need out of just the top 1/16th of an inch of water in San Francisco Bay, via Hydrogen fusion. So how is it these days with that other boondoggle; the NIF, the National Ignition Facility, with its supernova laser delivering hammer blows to secret fusion concoctions, to release more energy than was in the laser hammer blow; well that’s what they mean by “ignition”, the fuel bang has to be bigger in energy than the sparkplug delivered. Well actually it’s slightly more complicated than that. You see you have to get those hydrogenous atoms out of the top 1/16th of an inch, of SF Bay, and truck them over to Livermore, to hammer on with the Big Kahuna, so you have to figure in the cost and energy cost (at today’s gasoline prices) to get the fuel to the sacrificial altar in Livermore. Now I have been to Shiprock, New Mexico, where they have a big coal fired electricity plant, and I have seen the non stop ” death train ” carrying coals to the shiprock plant to get converted into electrons, and aerosols, and black soot, and asthma; not to mention carboniferous global warming. So at any energy facility, you have transportation bringing in the fuel to the plant, and maybe taking the electricity off to market, and of course getting rid of all the gunk the fuel turns into. So has anybody seen the water trucks bringing in the SF Bay top water into the NIF to smash? According to PHYSICS TODAY and David Kramer, they have overshot their “ignition” time limit by two years, and stll no sign of ignition, so they are shifting some of the hammer blows over to making bombs or other projects instead of hitting water with a laser hammer. Part of the hold up would seem to be in the accounting department, figuring out how much energy it actually takes to get the fuel to the hammer to splat. Kramer’s article has a nice photograph which shows part of the problem; they don’t really know just what is the secret fuel that is in those trucks; and it clearly is not water from the top 1/16th inch of SFBay; and the REAL FUEL takes a hell of a lot more energy to get, and get it over to Livermore to smash, than they ever dreamed of, so I guess we can expect ignition to not happen in our lifetime. You see the REAL FUEL is NOT Hydrogen, or Deuterium, or Tritium out of th SF Bay mud puddle; instead it is a 2mm diameter polished ball, that needs to be made about as perfectly spherical, as the optical figure of the Hubble Space telescope, out of exotic unmentionable Unobtainium layered materials, and somehow built around the Cryogenically Captivated HDT soup. Well it would be more like ice, even South Polar CO2 ice, than soup. Now supposedly the Big Kahuna now hammers at 2 megajoules per splat; but who the hell knows how much more energy it takes to make one of those super ball bearing fuel cannisters; that is what takes all the energy to get and truck over to Livermore. Well they probably machine them one at a time themselves, right there at NIF. So the hydrogenous ball bearings are what they really have to impove on, if they are ever going to get their free fusion energy gizmo making saleable electricity. Well Obama said he would drive the cost of electricity “sky high”, and NIF has that goal figured out pretty well. Imagine putting down on your job application, that you had experience in bowling alleys, setting up the pins; and you wanted something more exciting and challenging, like replacing the ball bearing fuel pellet in the NIF BK jack hammer splatterER. Maybe you can get close to setting up about 1000 per 8 hour day; about as many as a world champion sheep shearer can shear in a day. I seem to recall at a laser physics symposium in Texas some where, keynote speaker Charles H Townes told the audience, that if they thought laser implosion was a way to get energy, they were all crazier than a bunch of Texas drunks fighting over a barmaid. Well maybe I ad libbed on his wording; but what he said was consistent with what I interpreted him to possibly have been able to use instead. And if anybody knows what the heck is special about the top 1/16th inch of water in San Francisco Bay as far as energy is concerned, please enlighten the rest of us. Well fergit it; figgered it myself; the top 1/16th inch of SF bay is OYL !! I think a lot of folks are missing the top line in Figure 4. This line is telling in that, as more wells are being brought online, the previous year’s wells drop production. The total uptick in overall production is not that impressive. Knowing a bit about the availability and usability of the US coal deposits, I won’t be afraid to point out that we made an improper decision to bet so heavily on natural gas. Rent seeking industries normally fail. The natural gas industry has worked very hard towards advancing the CAGW agenda at the expense of the coal industry. Who is John Galt?… Still an appropriate question. Give us some of these gas prices in the UK please. It’s the Fischer-Tropsch process.The Germans did this when fuels became scarce during WWII. The South Africans may be still doing it. Ian W: Eventually, the price drops far enough and supplies seem secure enough more people purchase the gas or build gas fired generating facilities. This takes time. Therefore, initially there is a slight glut and prices fall, then the elastic demand bounces back and prices rise. Then eventually the base load power generation starts using the gas and the price starts to stabilize. Or the gas prices continue to fluctuate because of the negative feedbacks that you identify: increased use causes increased prices which cause both decreased use and increased production which causes transient surpluses and low prices, which then causes increased use and increased prices, etc. The idea of “stable prices” is backed by a few nice theories but not much empirical evidence. Almost all prices for almost everything have fluctuated. Right now, it looks like permanent low prices are out of the picture. Matt C : Knowing a bit about the availability and usability of the US coal deposits, I won’t be afraid to point out that we made an improper decision to bet so heavily on natural gas. Maybe. At the present time all we have done is reduce coal usage and increase gas consumption. As the gas prices rose, some of the power plants that converted from coal to gas have converted back from gas to coal. As is not unusual, fluctuating prices have produced fluctuating allocations. Meanwhile, the cost of producing electricity from solar power continues to decline due to investments in R&D in materials and in mass production. Already, for some uses in some places (irrigation in the Imperial Valley), the 30 year cost of electricity from PV panels is less than the estimated (with variations and uncertainties as described in this article) 30 year cost of electricity from gas. With continued investments in both energy sources, the prices of both 30 years from now will be different from now. I expect that for daytime uses like powering shopping malls, home heating and air conditioning, and schools, the cost advantage of gas over solar will continue to decline in more and more places. It takes a great leap of faith to assert that either gas or solar is destined to lose the competitive races. _Jim, just finished listening to a few hours on those updates and thanks for a heads up on lenr advancements. Seem much further than I was aware a year ago and many companies are heading on forward, M.I.T. now involved. I just have a feeling that underneath some of the hurrah they still seem to have a bit of problem with the consistency and lifetime but that might just be older news. Maybe not, but hope this can continue into a reality, but the story on the cover-up by the governments is really interesting now that it is all starting to surface. Sure shines a light on the corruption in science funding tax monies. The one thing I want to see is some tests that shows these can run for at least a year untouched except adding fuel (h2 or d2), instead of just a month or two. I mean, do the current models require bi-monthly maintenance as if the ‘catalyst’ core degrades over time? If this is going to develop into a “replace your $250 monthly winter gas bill with a $700 replacement of a patented nickel-deuterium catalyst bed every few months but it’s green and burns $50/L processed sea water” sorry, not interested! We have plenty of gas here. Hope this is not just another scam but it does make one want to see if you can just build one in the garage! When considering natural, renewable energy, coming primarily from the sun, as the only allowable energy source for the future, after combustible carbon is eventually exhausted, I think it is necessary to consider the limitations imposed by depending on this energy alone. Each person will require a fixed amount of the Earth’s surface area to collect all the energy needed to live. As government subsidized wind and solar power have only been able to provide about one percent of the energy we now use, I suspect that the maximum population supportable by natural energy would be much less than our current population. If no form of nuclear energy proves practical, we may be living in a last golden age of abundant energy. Some are saying that the current recession was triggered by rising (500%) fuel costs. Not exactly. No “conversion” was necessary. The power producers did not get rid of their coal assets (nor did they convert them.) They simply moved them to be a non-preferred production source asset. The coal boilers were still kept at pressure during periods of near peak loading, ready to produce power should the demand be there. When the variable cost curve flipped on them when comparing the high gas prices relative to coal and process efficiencies, they moved back to coal, which had again become the cheaper variable cost of power. Then the NG turbines became the peak producers instead of the coal assets. Meanwhile, the cost of producing electricity from solar power continues to decline due to investments in R&D in materials and in mass production. Already, for some uses in some places (irrigation in the Imperial Valley), the 30 year cost of electricity from PV panels is less than the estimated (with variations and uncertainties as described in this article) 30 year cost of electricity from gas. On an apples to apples basis, you will never find this to be true. Remove all government subsidies from both sides, eliminate net metering, eliminate SRECS, and then start charging homeowners for backup power the same way you do industrial sites that produce their own power and you will find that there is 0 advantage for solar (and indeed you will find that it is not possible due to the capital/capital replacement costs alone.) The only reason it works out for anyone now is the system has been gamed to make it so by not forcing the solar cell owners to bear the full cost of their power choice. Reposted due to popular request. Abundant (near)free energy soon available. Schematics of Rossi’s wonderful ecat leaked to public. The oil industry lobbies heavily against coal via the green movement. The objective is to close or convert coal plants to methane. If those plants close, remaining power production becomes more valuable, whether using coal or methane, or whatever. The object is to reduce production of power against demand, thus to raise the cost, create demand on methane and oil. ”The argument that we don’t have or can’t imagine alternatives to hydrocarbon fuels today means nothing. The majority of people couldn’t imagine steamboats, steam locomotives, hot air balloons … or any one of a plethora of other inventions. The industrial revolution, and the modern world have been powered by fossil fuels (mainly until recently, coal). This has brought huge benefits to humankind, and the natural world. I agree with WSBriggs on the inventiveness of millions of free human beings, allowed and encouraged and facilitated to explore and innovate. But, no matter how inventive, they aren’t going to create new viable, large and economic sources of energy out of thin air. We’re all going to be carbon powered for some decades to come. That’s the reality of world. acementhead: Thanks. The drawing says it all! I did not intend to open a can of worms (so to speak) on the LENR. It’s just that this is a science blog and I am always surprised by people’s posts. I suppose if a movement like AGW can keep going on fantasy data, I should not be surprised by what appears to wishful thinking on some topics. As I have pointed out on my own blog on science, if the government spent billions on wind turbines and solar panels that still fail to deliver as promised after 30 plus years, I should not be surprised by people sending for the “stick it to the power company–build your own turbine/panel and make them pay you” offers I get in emails. Alchemy never really died. Probably never will, huh? Thanks and again, I apologize for temporarily running off track here. Thanks for the opportunity to expand my knowledge in this area and for the websites to check out, including this blog from a year ago. Now back to discussing gas and oil! This article sounds about right. US production of oil plunged in the 1990s not because of supply problems, but because the price of crude fell below the levels in which the operators could reap a decent profit. NG is no different. Capital poured into the new finds while NG prices remained elevated. Once the extra production caused a steady drop in prices the incentive to keep supplies up fell. Demand would have to see a corresponding increase with supply in order to keep NG net profits up. I think the term is high volume low margins. Yes, you can convert Methane and Coal to liquid fuels. South Africa is still doing it. CVR Energy is converting coke to fertilizer as we speak in Kansas (somewhat related, though not F-T). In fact I know guys who were working with the Air Force to build an F-T plant to convert coal to jet fuel. The Greens shut it down because they don’t want an outlet for coal. It leads to Global Warm.., I mean, Climate Change. Same reason Keystone was shut down. Perhaps some folks can build an F-T plant in Canada to take Bakken associated gas and then export the fuels? Along those lines Shell has a colossal plant in Quatar which produces diesel from Natural Gas, sold here in the UK as “V-max”. I think I read that they are planning a similar project in the US. Also the production of synthetic fuel from coal is well-established, dating back close to a century. South Africa has been doing it since the apartheid embargoes and China is investing heavily. Well the problem with “Solar” whether it be “wind” or “PV” is that we know the sun only supplies about 1kW / m^2 or 100 W / sq ft at the surface I believe at about AM 1.5, and that is peak at normal to the sun earth vector, so geometry factors have then to be applied. So a whole boat load of land area has to be committed to getting more than very localized small supplies. It seems that somehow, the purveyors of at least the PV technologies, seem to think they are entitled to a property tax land improvement special dispensation that somehow other land users are not granted. Consequently there is no incentive to be efficient in PV solar usage. Most of the available (in volume) solar panels, are sufficiently inefficient, that nobody in their right mind, would purchase them to install in whatever valuable solar energy collection space they have at their disposeal. So the manufacturers / suppliers of these panels came up with the cute trick of conning home owners and others into letting the PV purveyor use their valuable solar collection space rent free, and then sell whatever electricity they can generate to the home owner, at a discount from what the electric utility charges. The company then of course writes off the inflated cost of their solar panels as a business expense; well they likely capitalize it at some acceperated depreciation rate. So the taxpayers, are subsidizing the purveyor of these unsalable inefficient solar panels, and the home owner is letting his space be used rent free. Such a deal. I would rent my solar collection space, on the basis of the 1KW / m^2 plus my local geometry factor, to the company that owns these solar panels; and then THEY can own the electricity they make, and sell the lot of it to the electric utility at an arms length transaction rate they can agree on, and don’t run it through my meter, just tap into my connecting line to the utility. That way, the PV vendor can get all the benefit of his panels, and just pay me a monthly rent for my solar energy that he can collect, and leave me out of his efficiency factor..
Bottom line is the PV panels need to be able to fully pay the cost of duplicating themselves, from the earth’s raw materials in situ. If they can’t, they aren’t an energy source. And yes, wind is worse yet. Finally a post with an author who Other will pay attention to! I’ve written to the GWPF about the Euro-Brit error in thinking that shale gas will bring in a new era of cheap gas. It seems that much of the world, even the global warming skeptic, technical world confuses price and cost in a supply and demand environment. Your principal point, that much drilling has been mineral lease continuation driven is correct, but there are two other points you should address in a followup. I’m in the business in Canada and I know how important they are to the current gas glut and low prices. The first is that most companies, including the large ones like Devon and Chesapeake, have large debts that need to be serviced, and large cashflow requirements to maintain other aspects of the company, which include shareholder perceptions. Regardless of preferred economics, flowing gaswells represent past expenditures – water under the bridge, as they say. The debt load MUST be serviced, however, so whatever revenues that come from existing operations have a go-forward economic value judged not on past investment but on price vs cost-to-produce. Gas wells are cheap once they are on-stream. The cost-sales price problem resurfaces only when the wells need to be stimulated, cleaned out, have new compressors or additions to field facilities to handle greater water volumes or freezing concerns, to name but a few. At that point the wells will be shut-in. But nobody really wants to shut in a well. 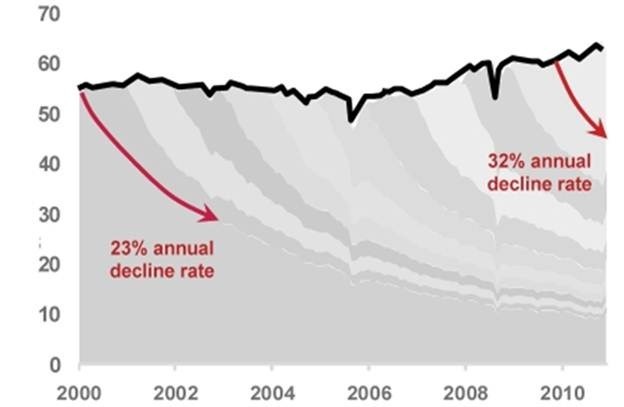 The risk of the well not coming back at the pre-shut-in rate, or not coming back at all, is real (and far, far worse for low-rate oil wells, especially lower gravity oil wells). Wells “load up” with water, condensate or oil while shut-in, and the producing flow redirects to other pressure sinks, or the productive channels plug up, not to clean up again. There are a lot of metaphorical frictions involved in a flowing gaswell no longer at virgin conditions; static friction is a real concern once the initial, higher pressure differentials or gas-fluid ratios are gone. So the desire to pay debt with ongoing profitable operations and the fear of shutdown any operation both lead the individual to keep producing. The hope is that you can survive until the upturn again, like the incoming tide, floats everyone’s boats. The second consideration you should mention is that much of gas production is the collateral of producing condensates or oil. Your economic model is run on the liquids; the gas is something you need to deal with, not what you are primarily after. You would prefer to make money on the gas also, of course, but you could even suffer a loss on the gas and your liquids-dominant project would still be worthwhile. This situation is standard for wells that produce sulphur: in my career I’ve seen the long railcars stained with sulphur yellow heading to Vancouver for the India-China fertilizer maket, making people local philantropists, and I’ve seen the “houses” of solid sulphur rising above the valley- lows where the unwanted stuff was being piled away from questioning eyes. There was even a time I recall when you PAID to have solid sulphur to be taken off your hands. “Associated gas”, as it is called, is like the sulphur: it will be produced as long as the principal component can carry the project costs by itself. Shale gas, and horizontal drilling for “shale” oil are relatively minor technical advances. The proportion of gas (and oil) recovery is low, and the cost, high. Nobody is initiatiing either in the current price environment outside the liquids and debt and cashflow issues. But these issues exist and will drive gas into the supply stream for some time. Shareholders who want dividends don’t care if the resource is being squandered; they have their own, short-term needs. Companies who need to maintain their other, non-gas production value can’t care about squandering their gas resources if the alternative is to watch their liquids-production operations decline: any decline in the oil and gas business is a public acknowlegement that your best days are past and the time for your company to be merged/sold/written off, its leaders sent to live beyond the pale. How does this end? Like a drunken man who staggers for a long time until he falls down, I suppose. That would be until bankruptcy forces mergers and shutting-in of production by a new management determined to “manage” the resource in a “prudent” manner (prudency in business occurs after a crisis, not in anticipation of one). The drunk might successfully stagger, however until until a friend props him up – the equivalent of the economy coming back and industrial need rises about 10%. The glut isn’t huge on a day-to-day basis, but the glut is cumulative, what with gas storage. But some elements outside of lease continuation as I have outlined, will keep gas production in an oversupply situation even when all producers recognize the non-cumulative reward problem of producing undercost. What is definite in a world of uncertainty, however, is that given the ability, gas prices will rise to more than equal the cost-to-customer because energy in must be less than energy out for all human endeavours. And since shale-gas style of gas production is fundamentally more expensive than the conventional style of prior years, the cost to consumers will rise, and to a level in excess of our memory. Luke: thank you for the clarification about “conversion”. To me, the main point was the switching back and forth depending on which was cheaper. about this: you will never find this to be true. I think your word “never” is unjustifiable. Wyoming government is actively pursuing purchasing NG vehicles. So are several other states. It makes sense in Wyoming with all the NG drilling. Yes, we drill for oil and refine here, but the NG is still cheaper than oil. As for price-guessing your way into the correct fuel for the future, it’s not really possible. You pick a fuel and go with it. But, no matter how inventive, they aren’t going to create new viable, large and economic sources of energy out of thin air. We’re all going to be carbon powered for some decades to come. That’s the reality of world. The reality of the world is that there is about a million times more energy (and perhaps a million times more risk) in a nuclear bond than in a carbon chemical bond. I believe that the Energy from Thorium advocates have made a good case for saying that the current solid-fueled nuclear reactor technology is sub-optimal, inefficient, and steam-explosion prone. Perhaps inventiveness will provide a safer, much more efficient, liquid-fueled thorium-breeder or uranium-burner reactor technology that consumes most of the long-lived transuranic, fission-prone, waste products that current solid-fueled reactors leave behind in spent fuel rods. Natural gas as it is makes a half-decent vehicle fuel. Using it as it is (compressed to 3,600 psi) uses more of the contained energy than turning it into grid power and electric cars. Converting it into a liquid fuel uses 30% to 40% of the energy you started with. The Qatari synfuels project was conceived at a time when the oil price was much lower. Since then, the international oil price has run up to the oil price in energy content terms. So, if the Qataris had built an LNG plant instead of a synfuels plant, that would be selling 30% more product – all at the oil price. That plant is a big, wasteful mistake. Coal for synfuels, almost all grid power should be nuclear. While we are at it, the sooner there are nuclear plants supplying steam and hydrogen to the Canadian tar sands industry, the better. That would save an amount of natural gas that would be equivalent in energy content terms equivalent to 20% of the heavy oil production – effectively increasing that production by 20%. There is much to be done, to answer Lenin’s question. Ric Werme – re your 1a) Oil and gas are linked to some extent in production but there’s little link in usage. 1b) see 1a. 2) Peak Oil looks likely to be a long plateau, not an off-cliff fall, so there should be plenty of time to adapt. David A; converting gas to liquid fuels does have an energy penalty. However you then end up with fuels which can be integrated directly into the existing infrastructure. Also the process can produce kerosene for jets where compressed gas is a non-starter. Wrt to the Qatari project, exporting the gas as LNG would have incurred significant energy and capital costs too and the writing is on the wall for oil-linked gas prices. From a recent interview with Shell (who financed and built the GTL plant), it cost $19 bn but is generating cash flows – after running costs – of around $8 bn per year. Doug Proctor’s explanation of the drivers of low gas prices has a strong historical precedent. Daniel Yergin’s excellent book “The Prize” recounts similar production patterns in the early deades of the oil industry. 2) Peak Oil looks likely to be a long plateau, not an off-cliff fall, so there should be plenty of time to adapt. I assume that’s the future peak oil “event” and not the current claim nor the past claims. My suspicion is that Peak Oil comes after new and cheaper sources of energy are available. Thorium reactors should have been developed decades ago (I see Chinese work on them as a good thing in a global sense), the hot E-Cat (assuming it works) has the potential to make a world a very different place. I agree; the energy density of fission reactors is orders of magnitude greater than coal or gas. And nuclear power is potentially a source of ‘clean energy’ in every sense. The problem is that the first time nuclear fission came to public notice it was used in bombs at Hiroshima and Nagasaki. I think it had to be, it shortened the Pacific war and saved, possibly, millions of lives. But, nuclear power has had to live with what might described as a PR nightmare legacy ever since. It’s not warranted but it hangs over any debate, and is used mischievously and, unfortunately, effectively by greens and environmentalists, of all shades (although not by James Lovelock). that they don’t involve uranium which has been given such a bad name. It will take some years-decades to come on stream, meanwhile we should stick to good-old uranium. I’ll just reply to the first part of your comments. I don’t really understand the last part. It’s true that immediately after WWII the Conservative Party, lead by Churchill, lost the 1945 election to Labour, which came in on a landslide. Various industries were nationalised, social insurance was introduced as was the national health service (NHS). I guess this could all look like Marxism, but it wasn’t, and many in the Labour Party were stalwartly anti-communist. Having said that communists in the trade unions were very active and powerful, and the New Left piggybacked on the cultural social and cultural changes from the 1960s onwards. This wasn’t planned. It just happened. UK dissenter, about uranium. Just remember that thorium when it absorbs the neutron it does then decay slowly to Uranium233 and it is that which splits for the majority of the energy. So any time you see thorium, think uranium. It’s just that the U233 doesn’t ever accumulate for it is always kept at the same low level within the thorium reactors core, as the U233 level drops, more thorium is added never needing to shutdown for refueling. So “involves uranium”, they sure do. Watch some of the videos linked above for a real understanding. While we are at it, the sooner there are nuclear plants supplying steam and hydrogen to the Canadian tar sands industry, the better. That would save an amount of natural gas that would be equivalent in energy content terms equivalent to 20% of the heavy oil production – effectively increasing that production by 20%. Wayne, thanks for the correction. I hadn’t looked into the details of thorium-based power and hadn’t realised that uranium, at low dilute levels was involved. Thanks again. in the estimates of available NG in shale gas, none of which should be trusted. There will be a huge upswing in LNG exports from US and Brazil beginning in 2014-2016 as Europe and Japan transitions to gas turbine electrical generation and the rest of the world transitions to CNG automobiles. Dr. David LeBlanc’s applause line was “Come for the thorium — Stay for the reactor!” He points out that the real advantage is the liquid fueled, molten salt reactor technology. The primary reason for using the more abundant thorium would be a lack of uranium. The molten salt reactor technology is so much more efficient than solid rod fueled reactors that Dr. LeBlanc estimates that a uranium price increase to $500 per kg would only impact the price of electricity produced by 0.2 cents per kw-hr. He says that such a price increase would greatly increase the amount of uranium available to mine. A single fluid, uranium burner reactor would also be much simpler to build than the proposed dual fluid thorium breeder reactor. An experimental uranium burner reactor has already been successfully constructed and tested at Oak Ridge National Laboratories around 1970. The signature feature of liquid fueled reactors is that they can burn almost all the dangerous long-lived uranium and transuranic waste, leaving behind only the short-lived fission products. On the other hand, Solid fuel rods must be removed after only a small fraction of the uranium is burned due to distortion caused by the accumulation of waste products. Dr. LeBlanc also points out that molten salt; uranium burner reactors should be much more effective for providing the high-pressure steam needed to recover oil from the tar sands. This application may allow this more efficient technology to develop in a remote region without impacting current installations and alternative technical developments.